Two-in-One Tiki-Brass Torch with Flame and Low Voltage Area Light. Great for decks and docks - repels insects! The VOLT® Tiki Torch Light is a modern tribute to the ancient tiki torches from Polynesia. Traditionally, tiki torches honor the spirits of fire and light. 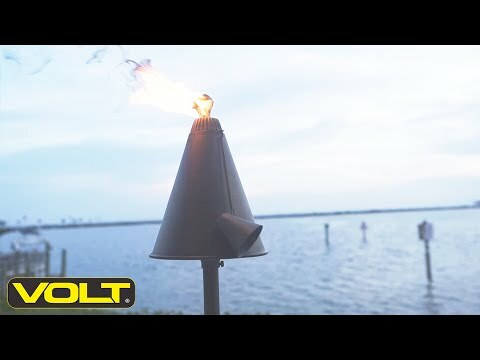 The VOLT® Tiki Torch keeps to this tradition since it contains both fire (fueled by an oil reservoir) and light (from an LED bulb located under the shade). In addition to lending a tropical look, this fixture functions as an insect repellent - keeping away those pesky bugs. This is accomplished by filling the reservoir with citronella oil. The Tiki Light also functions as an effective area light, projecting a wide circle of uniform illumination around its base. The fixture is typically positioned near the edges of decks and docks. In this way it functions to provide safety, security, and beauty. Lifetime warranty. Solid cast brass construction (including cap & chain) for lifetime durability. Natural bronze finish that will continue to beautify as it ages. Thick woven wick for large long-lasting flame. Silicone plug at lead wire exit prevents ground moisture and insects from entering luminaire through the stem. Extra-long (1-inch) strip-resistant threading and solid brass locknut for superior mounting stability. Dimensions Entire Fixture: 61" x 7.75" Top: 11.00" x 7.75" Stake: 13" x 3"